We caught up with Interior Design student Imy Green, and photographed her in her favourite pieces from Young British Designers current collection. Thomas Heatherwick - he’s just so understated but does such clever designs. Zaha Hadid - I thinks she is amazing! Which is your favourite piece from Young British Designers collection? The Dark Romance Skirt by Kelly Love - so light and floaty but also so comfy! Alice spoke with designer Natasha Hulse about her beautiful floral inspired designs. I first met Natasha Hulse whilst I was working in a bookshop, she had come in to look for an illustrated book on trees. We spoke about our mutual love for the English countryside, for plants and flowers, and also for doing things we love, agreeing on the importance of pursuing the things that make you happy.That was January last year, when Natasha was just starting out creating her beautiful bespoke headboards and since then I have been admiring her creations from afar via instagram. And so, this December, it was a real delight to be able to speak with her and take a look at her designs up close.Each of Natasha's stunning floral inspired designs is an intricate work of art, every piece is hand painted on linen, hand-embellished with embroidery and beading, and appliquéd in layers, creating a unique sculptural effect. Her craftsmanship is exquisite, and the time, care and patience put into each design makes each one even more exceptional.Her bold semi-abstract rendering of plant life is delightfully enhanced by the structural origami-esque composition of each flower, and this unique combination lifts her designs to an almost fantastical level - you might expect to come across one of her flowers in an enchanted forest. For me they cross the boundaries of design in an incredibly pleasing way, playing with composition, texture and colour. And each bespoke piece differs as her style continues to develop, creating an ever expanding variety, almost as though her evolving designs are imitating real plant life.Her designs, initially, were very neutral, with a timeless appeal, with blues, browns, whites and greens defining her colour palette. But as her style has developed and evolved, she has begun to work with bolder shapes and colours.Natasha enjoys the design generation process the most, and is inspired by nature and organic structures, from the foliage, ferns and mossy carpets observed when walking in the New Forest near home, to the wildflowers found on a trip to the Grand Canyon. She says she endlessly presses flowers, and uses them for design inspiration, her favourite flowers are the Amarylis, big and bold and the Poppy, so delicate yet so strong. 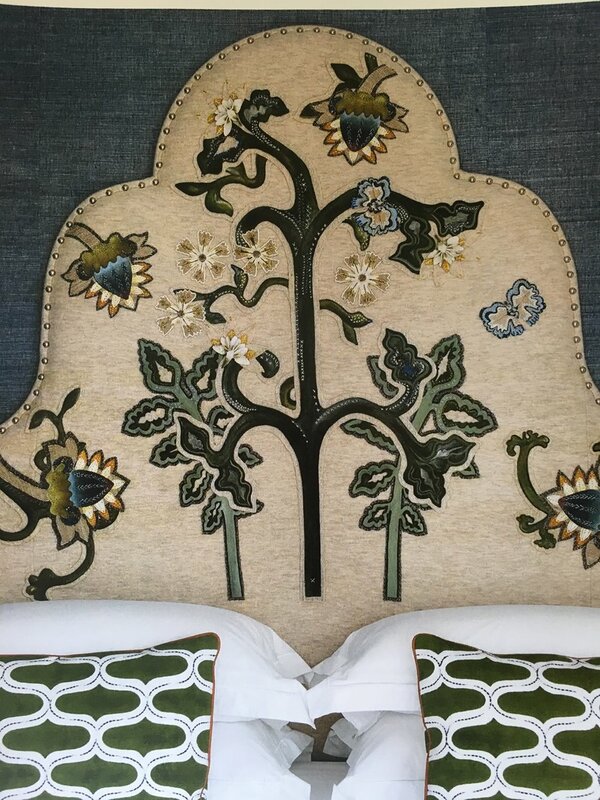 She is constantly discovering new flora, and a recent winter favourite is the bright colour of Barberries.Her first bespoke headboard was created as part of Kit Kemp's interior at the Whitby Hotel in New York, and since then she has worked with Colefax & Fowler on a number of designs. 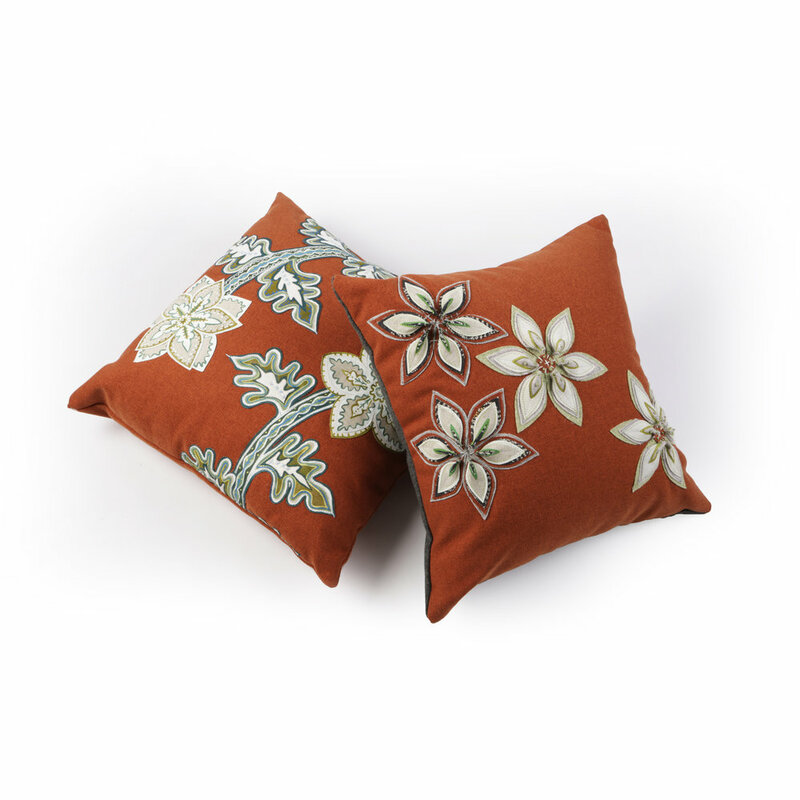 She has most recently branched out into cushions (I love her wisteria cushion) and a wall paper project with Kit Kemp. Currently all her designs are one of a kind bespoke projects, but eventually she would like to build up a collection of signature designs for clients to choose from. 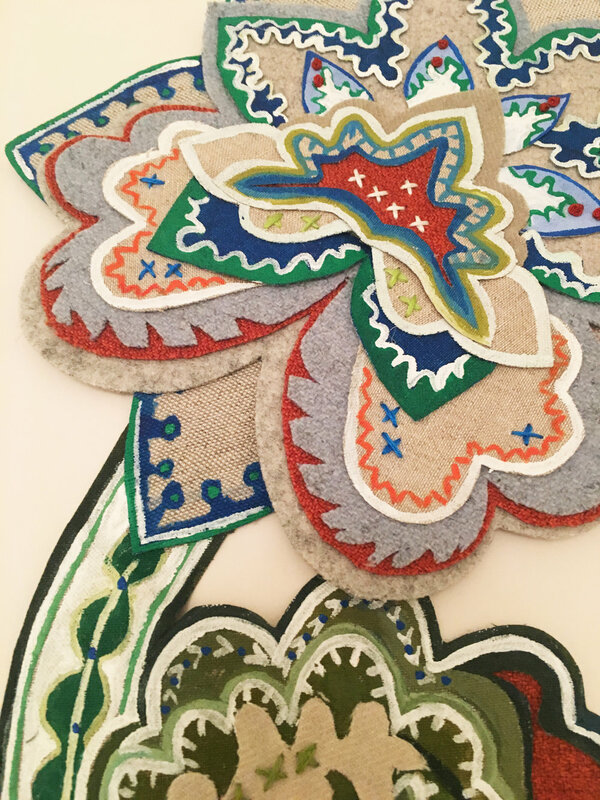 And she is more than happy to branch out, she would love to create designs for covered screens and ottomans at some point.Natasha has been appliquéing garments since she was 13. She took the BTEC at school, and was initially drawn to shoe design. She went on to study Textile Design at Chelsea College of Arts, and took an Erasmus year in New York where she focused on digital design and pattern cutting as well as taking a ceramics class. After graduating she started her own womenswear brand, and went on to freelance for two womenswear textile studios first in New York, and then in London.She says it has taken her a while to find her aesthetic, and although it has been challenging at times, uncertain which direction to focus on as a designer, she feels that the process has been important. Time and experience have helped her understand which direction she is happiest taking. Working with clients and designers has been an important part of this process, and she says she greatly enjoys the direction and influence of others, allowing her designs to continually evolve, although never wavering from her initial concept.I loved speaking to Natasha about her work, it is truly beautiful, so if you get the chance to see it definitely do, she often sells her cushions at fairs, keep an eye on her insta for all updates. Her love for nature and for creating by hand is so refreshing in our fast-paced digital and all too consumerist society and there is so much to be said for beautiful design that is the result of dedicated craftsmanship. Thank you Natasha, I can’t wait to see your next designs! Our favourite fashion picks for October, from (mostly) British brands. So keep scrolling, and happy shopping!! Trends are not for me. Style comes from knowing what suits your body, look and most importantly your personality. This month I have devised a plan of choosing items that can all be mixed and matched with each other and go from day to night. Example: Wear the dress, t-shirt, hoops, mules, jacket, hat and bag to work and for evening-glam, remove the t-shirt and hat - I got you covered, no matter the occasion! Underwear as outerwear, Mim of Parasol Rose produces these beautiful slips, dresses camis and knickers all made from silk and french lace. All garments are designed and made in the UK, the silk comes from Manchester. The idea is that you can wear these pieces as undergarments or overgarments - as they are so well constructed, the fit is incredibly flattering (it is really is, I tired the top and dress on), so you could wear a dress as of an evening, a top with a jacket, or save them for downtime at home. I really love the bright colours and they feel wonderful on! I am completely in love with the concept of P.i.C - an 8 piece capsule wardrobe that can be worn in 50 different ways. So a dress can be worn front to back, or back to front, and doubles up as a coat - genius. All clothes are made in London, and not only are the fabrics sourced locally but they are also sustainable, organic and often made of select stock material, so there is no waste. The ideal capsule wardrobe.I really love the Camden Dress below which can double up as a sleeveless jacket. Ille De Cocos creates luxurious separates made from the softest fabrics and yarns, and the results are wonderful. Perfect for layering, these are the perfect go-to every day pieces which feel as good as they look. I really like the jumper below. If you are looking for new jewellery inspiration, take a look at Layana London's collection. The jewellery is sourced from different up and coming designers, so there are lots of new, unusual and exciting things. Explain to me a little bit about your work as an illustrator, and the techniques you use? I studied illustration at Camberwell College of Art and graduated in 2011. Since then I've been freelancing part-time and worked on a range of different projects, mostly editorial illustration but also some advertising, food illustration and packaging design. My work is a mix of digital and hand-drawn illustration. All the colours are digital but the base of the illustration is always a drawing. Bat Country Collective formed as a fun way to collaborate and support each others work and “When Hell Breaks Loose” is our third exhibition in London. We've had different members but right now the collective is made up of me, Åsa Wikman and Ashley Amery. How did you and Bat Country Collective arrive at the theme 'When Hell Breaks Loose'? Coming up with a theme for a group show can be tricky. It has to be something that feels fun and inspiring for everyone taking part and something that is wide enough for everyone to be able to create the kind of work that they enjoy. As we live in different countries, I'm in Stockholm and the rest of the collective is in London, we usually communicate via Facebook. We had a bit of a brainstorm on there and decided on ”When Hell Breaks Loose”, it triggered all of our imaginations! How and why were you inspired to use the Russian prison tattoos for these works? I was given all three of FUEL's Russian Criminal Tattoo Encyclopedias for Christmas last year. After looking through them I knew that I wanted to make my own versions of some of the amazing tattoos. This exhibition felt like a perfect time to start working in the project, being in prison probably feels a lot like being in hell. I love your colour combinations - do you have a colour palette you always work with, or do you change it depending on project? I love colours and sometimes it comes really easily, the colours I want to use for a certain illustration. Other times it takes a bit more work to find something that feels right so that the colours play off each other nicely. I have a few combinations that I keep coming back to, but I try to challenge myself and not always use the first combinations that pops into my head. I usually spend a lot of time playing around with the ”Hue and Saturation” in Photoshop!